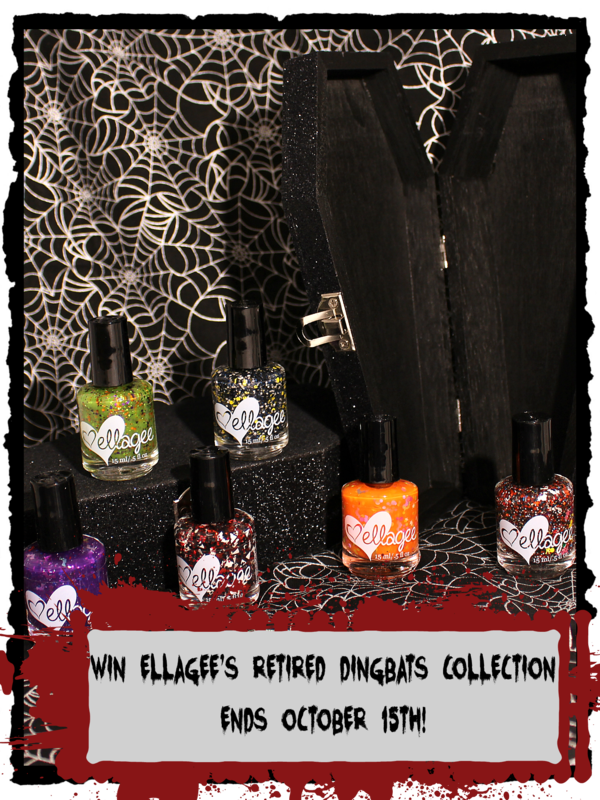 Halloween Giveaway: Win Ellagee's Retired Dingbats Collection! Thank you to Laura for donating the retired Dingbats Collection for this giveaway! Thanks for the giveaway! No plans for Halloween for me. There aren't many kids in the area. I suspect it will be a quiet night at home. Thank you Laura! I'm not sure what I'm doing for Halloween yet! Thank you Laura for donating the prize. I'm busy making costumes for my kids, a pink sloth and pusheen cat. Laura was so generous to give this to you to give to us! I'm such a fan of her glitters, and this collection is perfect for Halloween. Not sure what my plans are, but I'm thinking a Stranger Things costume this year. Wow, how cool! Thanks to you and the awesome Laura for having this giveaway! My Halloween plans are more like October goals, my bf and I are going to as many haunted houses as we can! I don't know the brand yet, it would be a perfect opportunity to try it ! Thanks so much for the giveaway Laura! I think we are planning on taking our son trick or treating then letting him spend the night with my parents and heading out to an adult themed Halloween party but we aren't sure just yet. I'll be sleeping and eating all the kitkats...the usual. I will be going over to my sister's house to watch my niece and nephews enjoy the Halloween fun! I've been away from home and Helmer all this month, and get back only the week before Halloween. So I'm going to spend every last day of October, including Halloween, going batty over my polishes, making mani-mayhem! Thank you, great giveaway! I'll be trick or treating.